"We noted no motion blur during fast motion in the NBA Finals"
There are limited picture settings and they vary depending on whether watching streaming, broadcast/cable, or player based content. Game – Accessed through the game control button on the remote control. Backlight – Cannot be adjusted when viewing Streaming Content. Set to 60 otherwise. A TV Brightness setting allows for quick changes in the backlight to accommodate various room light conditions. In very dark scenes from Noah, I could not get enough brightness to see the picture or shadow detail well. The LED backlighting in this little Sharp TV are impressive and black levels are well saturated. Once calibrated, color rendition was good though not of the best caliber when we tested with our standard Fifth Element BluRay disk. For a TV in this price, I was very pleased with contrast. Dark shadow detail during Noah needed some work during several very dark scenes. 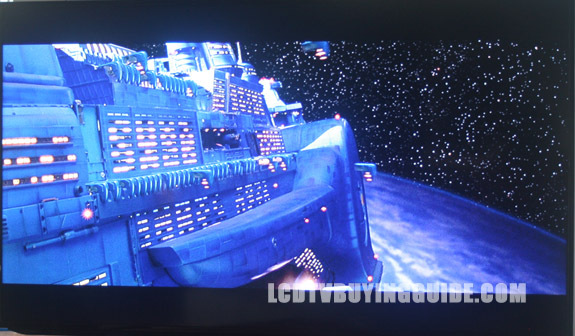 There was some false countouring noted during Fifth Element when some dark areas looked splotchy. "Side angle viewing and a flattish picture were negatives"
Drawbacks are typical Sharp LED TV negatives, starting with a flattish picture with little depth, side angle viewing contrast reduction noticeably starting at around 20 degree off center, and some backlight uniformity issues. The picture is better than almost anything in its price range though with competition only from Vizio as a reliable alternative. Depending on the programming we noted judder from time to time, but the LE653U did a generally good job especially with BluRay based content. The AquoMotion setting will reduce judder while introducing a fake look often called the soap opera effect. You'll get used to the judder, so we normally recommend keeping the Film/AquoMotion setting off. 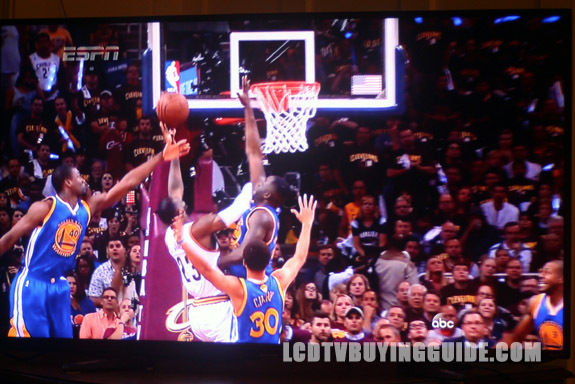 Watching some top notch programming like the NBA Finals in 1080p HD did not show any judder regardless of whether the Film/Automotion setting is on or not. While this mode is fine for watching normal cable or broadcast TV, it does not perform well with DVDs or Blu-Ray discs. It's a de-judder mode that removes judder for movies but also removes too much of the natural background blur that is supposed to be there. So we recommend turning it off for film based content. Otherwise, you get the dreaded “soap opera kitchy cardboard cutout” effect during films as background blur is eliminated. When you turn it off, you will likely notice some judder effects for a slight time until you get used to it. Ironically, you may want to leave the feature on for live action sports or other live fast motion programs as it delivers a smoothing quality. "The picture is well saturated, and blacks were impressive"
Depending on the programming we noted judder from time to time, but the LE653U did a generally good job especially with BluRay based content. The AquoMotion setting will reduce judder while introducing a fake look often called the soap opera effect. You'll get used to the judder, so we normally recommend keeping the Film/AquoMotion setting off. There is no adjustable judder reduction feature however we did not note much judder when viewing programming. There may be some motion lag with fast sports. Vudu Apps — Provides links to TV shows such as TrueBlood, CNBC, Nova, Discovery, flickr, CBS Nightly News, Facebook. Gaming input lag was surprisingly solid on the LE653U particularly for the price of the TV. We recommend the Game mode which helps slightly. At around 37 milliseconds we were pleased with the speed. The LE653U is acceptably good looking with a ¼ inch black gloss plastic frame. The stand design is a bit awkward, but works well. 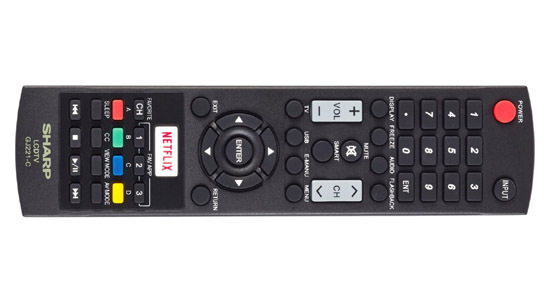 The included remote control has plenty of buttons, with one large convenience button for Netflix. The 5-way controller is standard and allows navigation of Apps, and the very limited browser. Overall it's a well laid out remote. 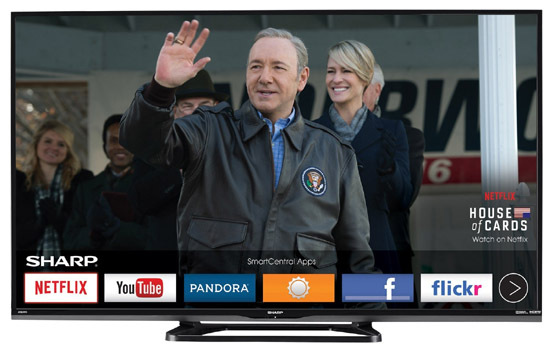 The menu is simple, but not as intuitive or easy to use as most new TVs. There is plenty of volume, a positive. A setting of 19 out of 100 is all we needed to fill a large room. The quality is somewhat hollow and definitely not robust and full from the two 10 watt speakers. Voice definition isn't bad. At $277 for a 32” 1080p TV there is tons of value here in a solid picture quality with strong black levels and good light flow through. Sharp is a good name in TV manufacturing and we like their reliability. Though the Smart TV function is not the best, it's a plus to have it. Competition is from the Vizio E-series TVs.